Mackay’s Transport provides warehousing and distribution to major furniture retail chains. Mackay’s Furniture Transport has been operating since 1992. We service SE Qld, plus Cairns, Townsville, Mackay, Rockhampton, Gladstone, Bundaberg, Hervey Bay and Noosa weekly. We also have a depot in Sydney. 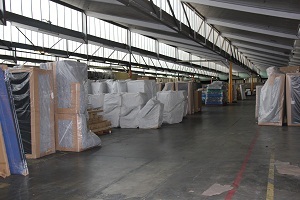 Our logistic warehousing has tripled in size to 8000 square metres since 2004 to cope with our expanding customers. This allows us to warehouse metres of furniture for our customers needs each week, thus we are able to handle large volumes of freight. Our staff has experience in handling and packing furniture. All our team have been working with furniture for numerous years, ensuring items are padded and packed correctly. Our vehicles are meticulously serviced and maintained with Malcolm Mackay personally overseeing all duties. It is this attention to detail that Mackay’s Furniture Transport is renown for. If you require large scale transportation and storage, please complete our online ENQUIRY FORM and we’ll get back to you to discuss your requirements. Copyright © 2019 - Mackay's Transport Furniture - All rights reserved.